YUM. I am thrilled about being able to make my own cream sauce. It was super easy and now I know how to adapt this for soups etc. No more canned mushroom soup for this girl! Of course, I sought out the least amount of ingredients when I bought them, but this is one less thing to buy! Woo hoo! Preheat oven to 350°. Cook pasta according to package directions, then set aside. Heat large fry pan over medium heat, add 1 tsp. olive oil, mushrooms, and onions. Cook until onions become translucent, about 5 mintues. Add butter and once butter is melted stir in flour stirring constantly until evenly distributed. Slowly poor in milk, and chicken broth, and garlic continuing to stir occasionally until thickened about 15 minutes. While the sauce is thickening bring water to a boil (enough to cover green beans). Add green beans once boiling and cook for 4 minutes, drain, and rinse with cold water to stop the cooking process and set aside. Once the sauce has thickened stir in parmesan cheese. Combine pasta, cubed chicken, green beans, and cream sauce until well combined. Place pasta mixture in a 2.5 quart casserole. To make the topping combine panko crumbs, parmesan cheese, and olive oil in a small bowl. Distribute mixture evenly over the uncooked casserole. 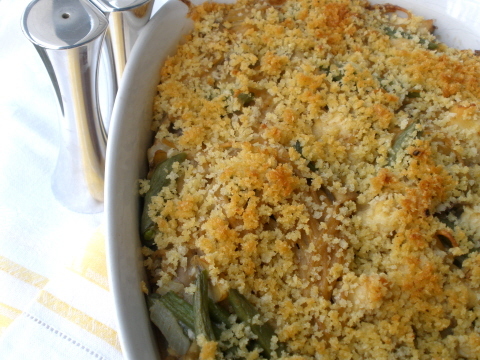 Place uncovered casserole in 350° oven for about 30 minutes, or until panko crumbs are golden brown. Enjoy!